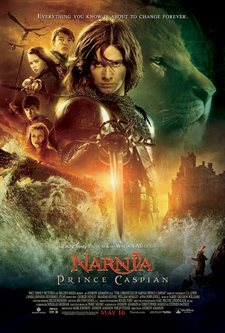 Download Chronicles of Narnia: Prince Caspian in Digital HD from the iTunes store. Chronicles of Narnia: Prince Caspian images are © Walt Disney Pictures. All Rights Reserved. Much delayed, Prince Caspian has been released almost two and half years after The Chronicles of Narnia: The Lion, the Witch and the Wardrobe. The original cast of the Pevensie children has returned, along with Liam Neeson as the voice of Aslan. I went to see Prince Caspian really with no expectations, and I came out pleasantly surprised. While there were a few hiccups along the way, I really do believe that it deserves the rating I have given it. It's one year after their adventures in Narnia that were chronicled in The Lion, The Witch and the Wardrobe, and this time we find the Pevensie children living in London once again. With the Battle of Britain over, it appears that life has almost returned to normal for the kids. Almost. But that's not where the movie begins. That is where the book begins, and to be honest, the movie does it better. The movie begins with Prince Caspian driven into exile and to the point where the Pevensie children are summoned back to Narnia, which returns the viewers to England, circa 1941. We find that Susan is a loner, Edmund was matured, Peter is a little too full of himself, and Lucy is still the optimist of the group. This is one of the places I feel the movie lacked – there was very little in the way of explaining the first movie, so if you went into the movie without any context, you may not understand why the children acted the way they did. After a few minutes in London, the kids find their Underground station collapsing away, and instead of the platform, they are now standing on a beach. No hesitation from them at that point as they basically decided immediately that they are back in Narnia. The movie slowly builds up the story, with the children figuring out that they have been away for many centuries, while Prince Caspian's story continues without them. Prince Caspian, it turns out, was rightful heir to the throne of Narnia, who is now completely under the rule of Man rather than the rule of Aslan and the four thrones of Cair Paravel. In the time after the children left Narnia at the end of the first movie, men known as the Telemarines invaded Narnia and drove the creatures we met in the first movie like talking animals, fauns, centaurs, dwarves and minotaurs into the forest while the Telemarines controlled the rest of Narnia. The Narnians as they are now called had disappeared enough so that the Telemarines had thought there were extinct. However, Prince Caspian was not old enough to assume the throne when his father, Caspian IX, died. So the kingdom was ruled by his uncle, Miraz, until the time when Caspian can assume the throne. But Miraz wanted the kingdom for himself, and once his own son was born, thus providing him with an heir, he conspired to remove Prince Caspian from the lineage to the throne. Miraz blames the Narnians when Prince Caspian disappears, accusing them of kidnapping him at first in order to obtain support of the other Telemarines and build their war machine to conquer the Narnians completely once and for all. So the story begins slowly, from getting the Pevensie children up to speed to intersecting their path with Prince Caspian's. Along the way, the story unfolds and the stage is set. And where the first movie lacked, Prince Caspian doesn't disappoint. Once the battles begin, the film doesn't let up. The battle scenes build during the scene itself, with each part of the battle leading to the next with no fluff or filler included or needed. The characters grow with each passing event, leading to the eventual climax during the final battle. Ben Barnes as Prince Caspian did a wonderful job throughout the film, from his transition of Caspian, heir to the Telemarine throne to Prince Caspian, hero of Narnia. One thing I feel is lacking in modern storytelling from Hollywood is character growth, and Ben pulled it off throughout the movie. At times, Caspian had to defer to Peter Pevensie, who was and is High King of Narnia, and Ben was able to portray his emotion of actually biting his tongue many times during the movie, just as his character would have due to the honor and respect of the chain of command. Sergio Castellitto plays Miraz, Caspian's uncle. He played the quintessential villain with an almost unbelievable charm, especially as one that would stop at nothing to win. The two places where this movie stumbles were the background of the Pevensie children's behavior at the beginning of the film, and Susan's growth during the film. Without context, their behavior may seem strange, but with the proper context it is understandable. Peter's behavior at the beginning of the film, and even after they arrive in Narnia (while he does grow as the film goes on) is because he was High King of Narnia before. He was a young teenager, whisked away to Narnia in the first film, where he and his brother and sisters spend at least a decade maturing as the Kings and Queens of Narnia before they are returned back to Earth where no time has passed, and they are the same age physically, but not mentally. Imagine becoming High King of a land and then going back to being a young teenager in school! With that context, his behavior is understandable. Susan's behavior and attitude at the beginning of the film compared to the end of the film was the other stumble that I saw. At the beginning, she is a loner and standoff-ish to the advances of a boy her (physical) age, and I can see where she could come from due to her maturity age. 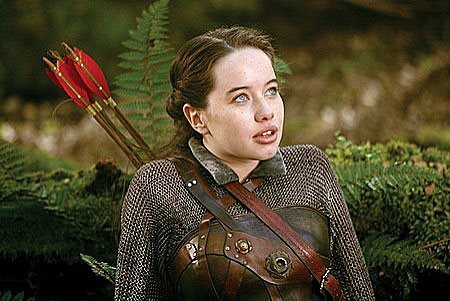 Then she is in Narnia, where she all of a sudden is completely confident and outgoing as a leader with almost no explanation. Then, at the end of the movie, she does something that, is very ironic compared to her behavior at the beginning of the film, and especially considering how the tale comes to an end in the last book. But my problem was there wasn't an established reason for her actions at the end of the film, as her brothers and sisters all had linear patterns of character development in the movie, but not hers. In the end, these stumbling points weren't enough to derail the film, and that is why I am giving it a grade of A-. Without those stumbling points it would have been a solid A, as this is a movie that does a great job of telling a story with character development and appropriate action to go with the story with no needless additions. 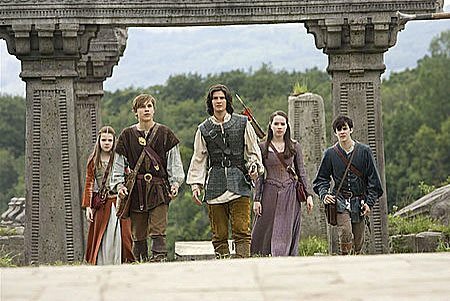 Chronicles of Narnia: Prince Caspian images © Walt Disney Pictures. All Rights Reserved.